Scroll down to your list of volunteers. 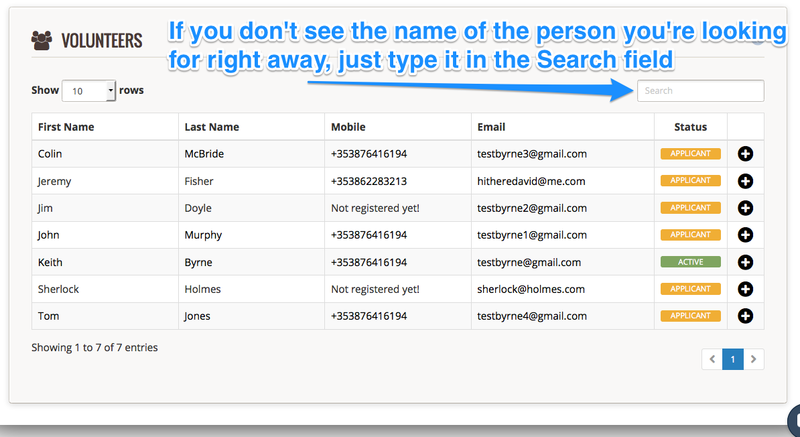 If you don't see the name of the person you're looking for right away, just type it in the Search field. On the face of the card for that document, there are a couple of options of things you can do with the document that has already been uploaded into your Document Store. On the face of the card for that document, simply click on the icon of an arrow pointing down into a filing tray. This will automatically download the document to your computer (check the Downloads section on your computer). Deleting the document removes it entirely from your Complyfile. To delete the document, click the 'X' on the card. This will bring up a pop-up on your screen asking you to confirm you want to delete the document permanently from your Complyfile. To delete it, press 'Confirm'. If you've changed your mind and don't want to delete it, press 'Close'. Change the visibility setting of the document. Can we pay by invoice billing?